Wow…it’s never been that high before! Above is a picture of the burn at the bottom of our garden. Nothing unusual in that except the burn NEVER gets that high. Not in the decade we’ve been living here anyway. I’ve seen it quite high before, but not so it’s almost flooding our back garden. Normally it’s a lovely meandering little trickle coming down off the hills and making its gentle way to the River Clyde (which is about five house widths away from my house). I say ‘lovely’ with rose tinted glasses on cos it’s a midgey infested nightmare when the summer sun starts to set. Anyway, I digress. In the winter, I concede, it does rise as the water washes down our way, but not to this extent. In case you were wondering, the drop from that lovely fence (built by my lovely hubby and his dad) to the normal height of the stream is probably about four-and-half to five feet. 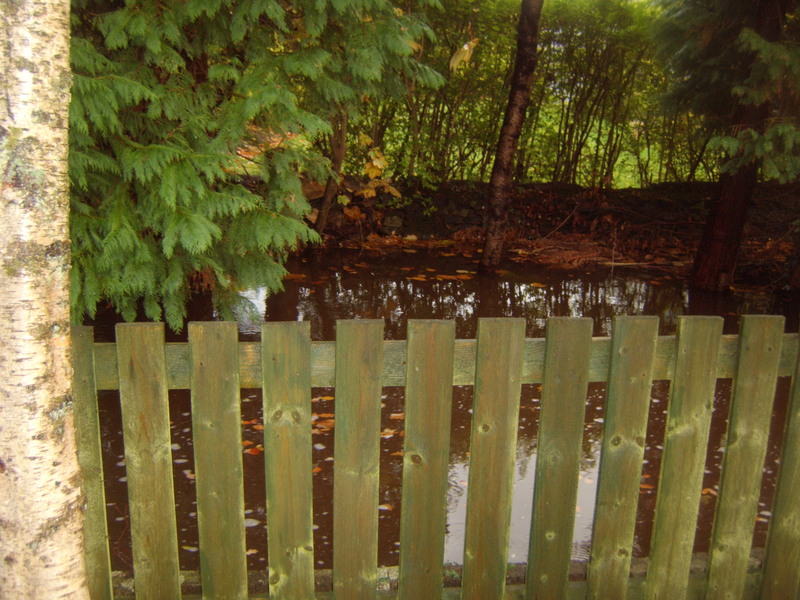 At the moment, the water is lapping the bottom of the fence. Sigh. Our garden is really water logged too. It is squelchy underfoot which was pleasant until I slipped en route to taking this picture and nearly fell on the sodden grass. Just shows you how much rain we’ve had in these parts recently. It was raining again today. Talking of today, I would like to wish my mum a happy 65th birthday. I had such great plans for today which were kind of thwarted thanks to a nasty tummy bug that’s been going round this area. Here’s what happened…I dropped the girl off at school and me and the boy went over to my parents’ house. The boy was supposed to stay with his grampa, but wanted to come with us, so me, mum and the boy got back in the car and drove to Silverburn (for those who don’t know it, it is a large shopping centre in the Pollok area of Glasgow). I intended taking my mum shopping for a birthday pressie and then we were going for a nice lunch at a local Tapas bar. We had just got to Marks & Spencer when I got a call from my daughter’s school saying she was ill. I had to quickly buy my mum’s pressie and then dash back and get the girl, who, admittedly, was chalk white and ill looking. Anyway, instead of a lovely lunch at a wee bistro, mum had to settle for macaroni cheese at mine. The girl went to bed for a sleep. She seems better now, but still has a high temperature. Hopefully, that will be it for her. I will probably keep her off school tomorrow to make sure she’s okay. I will take my mother out for lunch on another date. PS still reading Little Women…it is SO good.